Well people I start my trucking career in two weeks at Prime in Springfield. I'm pretty excited. I have most of my stuff together and ready for the bus drive there (birth certificate, blanket, pillow, 5 days worth of clothes, phone, iPad, ect). I'm going to continue to study hard and give this 110% to I can pass everything the first time. I'm prepared to be gone for 2 months (8-10 weeks) this initial time out. Just making this as my log for training and just wanted to share. Wow! Tons to think about. I was thinking about flatbed division because the exercise would be nice and the experience I feel would be useful down the road if I wanted something more local down the road. Through some of the research I've been doing the biggest benefit Is faster load/unload times. Not sure if they get as many miles or see as much of the country at prime as reefer. 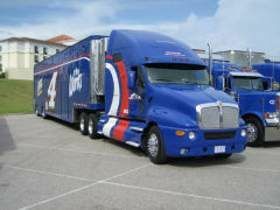 Curious to know if any of you have done both flatbed and reefer side of prime and which one you thought was better? I start prime soon and looking for more info.